The Value of a Facebook Fan: What’s it Worth? Just recently, I approached Bruce with an idea for incorporating a contest into a reveal tab on our Facebook page that I was sure would increase our “likes.” I had it all planned out and it was going to be FANtastic (pun intended). But, Bruce and I got to talking about it … and he posed the question: “Why do we want more ‘likes’? I sat for a few seconds, and realized that the answer: “Because it’s the cool thing to do” really wasn’t going to cut it. I realized my affinity for unicorn and rainbow social media tactics simply wasn’t going to cut it this time. I was guilty of ignoring the nitty gritty metrics and simply jumping on the Like bandwagon with its popularity contest mentality. I knew there had to be more to the value of a Facebook fan story, and I’m on a mission to uncover it. And that’s what we’re here to talk about today. In my quest to uncover the value of a Facebook fan, I remembered a report a friend of mine sent appropriately titled, “Value of a Facebook Fan.” The report, by social media management company Syncapse, shares findings based on survey data from more than 4,000 respondents in the summer of 2010. I figured now was a great time to dive in, and I wanted to share what I learned with you. Before we go into the details of the monetary value of a Facebook fan, let me first say that I personally think ALL people in our Facebook community are valuable, but that doesn’t pay the bills. So today, we’re talking numbers. I’ll still fight for my unicorn and rainbow approach to social media whenever I can. So stay tuned for that. On average, fans spend an additional $71.84 on products for which they are fans compared to those who are not fans. Fans are 28% more likely than non-fans to continue using the brand. Fans are 41% more likely than non-fans to recommend a fanned product to their friends. The report identifies the behavior and motivation between fans and non-fans of a brand on Facebook, showing how a fan can impact variables such as product spending, loyalty, propensity to recommend, brand affinity and more versus a non-fan. According to the report, the value of a fan varies greatly from brand to brand. What’s more, some fans within a community are more “valuable” (in terms of bottom line) than others, based on certain factors like level of activity. This implies that you can’t count your popularity by likes alone. If you have a strong brand outside of just your Facebook likes, this may actually decrease the value of the like. So, if non-fans are just as loyal, then the value of a fan is less. The report also talked about the variation in fan value within a community. For example, data shows an average fan may interact with a brand 10 times per year and make one recommendation for that brand, while an active fan may participate thirty times and make 10 recommendations. The goal for a Facebook community, then, could be quality over quantity. To not simply garner new and more fans, but nurture the fans you already have to make the relationship even more valuable. This is an especially interesting idea when you consider the recent findings from Visibli that shows the more number of fans, the lesser the engagement level. The idea of quality over quantity can make sense for brands that want to maintain that personal touch. See, if you have 100,000 or more fans, the question of how to maintain a community comes into play. 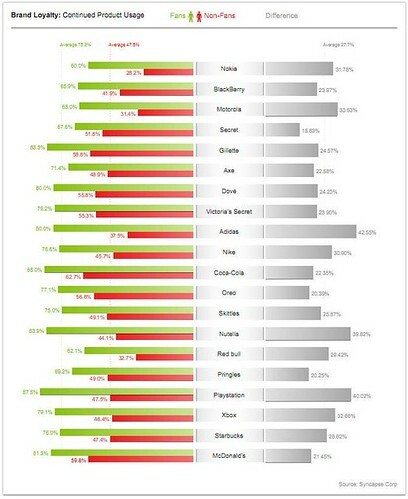 The report shows how much more likely a fan is to purchase a product from the brand. As I highlighted before, the findings show fans are likely to spend, on average, about $70 more on the brand versus non-fans. But how does this data translate to B2B companies, where the price point is higher, the sales cycle is different and the fan base may not be the decision makers? 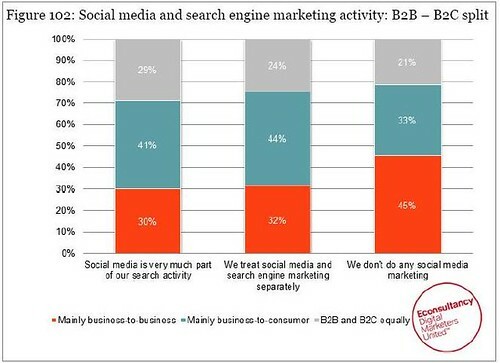 In the recent SEMPO State of Search Marketing 2011 report, it showed that B2B companies are far less likely to engage in social media. I can understand the additional challenges that B2B companies face when looking to track ROI on Facebook. I figure a good analysis of our fan base on Facebook is in order. Who are these people that follow us and why? Do we care if they’ll ever buy our products or services? Can they afford our products or services? Or, as a thought leader in the industry, is simply being a part of the conversation and forming relationships with our community all that matters? Sure, a B2B brand’s Facebook network may not have the key decision makers needed to affect the bottom line – in fact, it may have direct competitors in its circle of friends. But there are other benefits to having those people in your community. This is especially true in the online marketing industry, where it’s beneficial to nurture relationships with other marketers, even if you are competing in the same space. In this case, the value may not be directly linked to a dollar amount, but ROI could be measured in other things, like an invitation to a speaking engagement or a referral for a client your competition is passing up – the scenarios are endless. Plus, there are so many variables if we’re talking numbers; if you have fewer fans but a higher price point, and one of your fans converts as a result of or in part due to Facebook efforts, then it could potentially have more ROI than if you have a lot of fans and more conversions at a lower price point. And if we scrap numbers entirely, we can focus on things like engagement and cross-promotion. In my experience, those fans who are most active on our Facebook community cross over into other communities of ours as well, such as the blog and Twitter. At this point in my research, I was beginning to understand that building a case for Facebook Fan page success based on “likes” alone was not a valid argument. Moving further away from numbers but into metrics that are just as important, let’s look at recommendations coming from fans of a brand. The data shows favorably that fans tend to recommend more than non-fans. The report states that of those surveyed, Facebook fans are 41 percent more likely to recommend a product than their non-fan counterparts. Makes sense, right? But let’s take this a step further outside of what the report highlights. The idea of recommendations directly correlates to social search, which ups the ante on the value of a fan with regards to recommendations. In this case, the value of fan as it relates to word of mouth can be even greater than what these findings allow. And in the report, the findings show that 38 percent of respondents would likely become a fan of a company page if they saw a family member or close friend do so. Thirty-four percent said they would do the same even if it were just a person they knew through Facebook. How will this increase the chances for more fans when someone sees a recommendation from someone in their community either in the search engine results pages or through search features like Google +1? Research shows that 81 percent of fans feel a connection with a brand they engage with on Facebook versus 39 percent of non-fans who said the same. Eighty-seven percent said they felt warmth, gratitude and happiness towards a brand versus 49 percent of non-fans. And why not? When a brand takes the time to interact with its community, it humanizes that brand, it creates a relationship between the brand and person. Networking has always been at the root of successful business communities. So, this is where I once again defend the unicorn and rainbow approach to social media, and assert that taking the time to nurture relationship is one important metric that can’t be ignored and can impact the bottom line. In the end, Bruce and I decided that while we value fans and likes, we didn’t want to have to force people to Like us in order to reap the benefits of offers we present to our Facebook community. In fact, we have non-fans (those who have not officially clicked the Like button), that engage on our profile more than our fans do. If using this report findings as an indicator of value, these non-fans could be just as, if not more valuable than a fan that has not engaged since they pressed the Like button. So we decided to leave the idea of luring people to like us alone. If you want to join us in our Facebook community, great; if you want to endorse us by liking our page, even better – but the important thing is that you’re there. If you’ve ever sat down to try and understand all the metrics you can track to measure social media efforts, your mind may have been blown a couple times over. Not only are social media metrics aplenty, but also interconnected. One can impact the other, can impact the other and so on and so forth. So, when sifting through all the ways one can measure their social media efforts, it’s important to understand each individually, and then how they’re connected as a whole for any given brand. And that ain’t an easy task. But, as the aimClear team reminded us earlier this week, you set the goals you want to reach and the metrics you want to track to measure the success of your social media marketing efforts. That said, in exploration of the value of a fan, I realized it was just one tiny metric in a sea of important variables that measure success. And popularity through numbers does not always equal success. Thanks Jessica, I’ll check out Brand Leadership and Dan Zarella’s stuff. I think we’ll end up with the right balance as we’re a pretty young company (meaning both the ages of our team members and as a company), we’ve got a sweet redesign coming that we can highlight, and we’re eager to be more personable and human than “professional”. Thanks for trading ideas/questions. Have you defined how you want to present your brand yet? Doing some exercises in branding if you haven’t already might be an eye-opener. There’s a book called Brand Leadership by David Aaker. I recommend. Thing is, lots of big name corporations are fearful of “letting loose” in social media. They’ve worked hard to build up a prestigious image and are concerned that social media communities can ruin it. But social media is a time to rebrand. To make a company more accessible to the public. I can tell you from experience, professional can sometimes equal boring on Facebook. And what is professional anyway? You can still add something of value to your community without being super stuffy about it. I think that’s key — value and engagement. At any rate, Facebook is a platform to be more “yourself” — be funny, be real. Sharing something humorous on The Onion is fine, but the question is: how does it relate to your goals and your brand? If it’s totally unrelated to what your company does, it is worth the post? Interacting with your community in a friendly way is a great way to build loyalty. Of course, you may have to set boundaries, but I think the boundaries are set by deciding what types of information and interaction are the most valuable. Experiment and see what types of updates get the most feedback — articles, images, videos, etc. I heard somewhere recently that video-sharing on YouTube is well received. And check out Dan Zarella’s stuff on social media. He does a lot of studies on what works and doesn’t. Your company has a pretty solid following, and I can see that you’ve put work into your Facebook page. I noticed you don’t have a ton of images though; maybe you want to experiment with taking more pictures of the staff in action, things that give people an inside glimpse into HireAHelper and see if it’s well received. Post and track. Use the Facebook Insights to see what things you’re doing that are the embraced by your following. We’re all trying to get a handle on this crazy thing. Thank you for your insight. Enjoy trading ideas! We’re still defining our goals, but one of the big ones on the discussion table is definitely having as many “likes” as possible. The other goal we’ve talked about would be positive/active interaction with the fanbase. Either way, the debate we’re having right now is whether our posts should be funny youtube videos, funny theonion posts, etc. or if we should take a more professional stance. I think the answer is probably somewhere in between – putting lots of “professional” thought into which funny/interesting things we post (I like your suggestion of controversial). My personal opinion is that it’s far better to engage with the people in your community and risk losing a “like” here and there, because solidifying relationships is a crucial aspect. Unless you are saying anything totally offensive in your status updates (remember, controversial and offensive are two different things — controversy can actually work to your benefit if done with tact), I think you’ll always get the one or two people who unlike you every once in a while for whatever reason. Thanks for the comment, hope to hear a reply! Thanks for the post Jessica. I’ve been sharing and re-sharing it with people here at our company as we’ve been having a pretty big discussion on what to do now that we have Facebook fans. The fear is, the wrong type of engagement gets them to unlike you, or worse, mute you in their news feed. So staying silent and not losing likes is appealing. But then we’re not actually interacting with our FB community, we’re tallying popularity votes. I guess if it were easy every body would be great at it, and it’d lose its value. Lucy, you have a point! I can see how someone who “likes” a Fan page may already be a supporter of the company and have already made up their mind about the brand, so perhaps the “like” doesn’t figure. Or, maybe there is some people who stumbled across your community and didn’t make their mind up about you until they interacted with you. Maybe it’s the humanizing of that brand and the personal interaction that caused the brand loyalty. But, how do we measure ROI if the person never buys from you or if nothing ever comes from the relationship (say a speaking engagement or something else)? In that case, do we just chalk it up to brand awareness and engagement? A very interesting post with some useful insights. One thing that always interests me when people try to measure the ‘value’ of a Facebook fan is this: can the fact that a person who Likes a page spends more than a non-Liker not be more attributed to the fact that they’re already a fan of the brand itself (which is why they’ve Liked the page), rather than the idea that they’re spending more BECAUSE they’ve signed up to the page? It’s highly likely they would have spent the same amount of money on the brand regardless of whether or not they Liked the page…so where does this leave us in terms of measuring ROI? It’s a tricky one (and I say this as someone who works in social media!). Hmmm … could be — that would be an interesting post, to explore Facebook behavior for business by country. I like your approach to your Facebook community. Have a good weekend, Kent. Always nice to hear from you. I am not quite sure if Malaysian facebook users have to same behaviour as western countries facebook users. A lot of people on Facebook simply click “like” without even knowing what my Facebook page is. Unless, as you said, you are a big brand like Coca cola, Nokia, etc. I have more than 1000 fans on my company facebook page. “Like” really means nothing to me until I started communicate with them and engage with them. For me, the facebook “Like” for my facebook page is still a very general market, I need to communicate with them and draw them to my own database to filter them. Then those who sign up become my targeted market which can generate higher conversion rate.